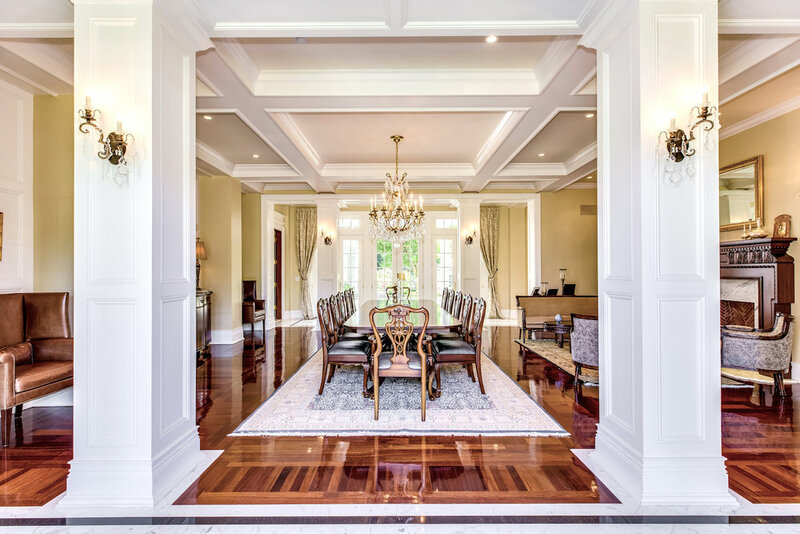 Situated on over 6 acres of perfectly manicured property and located on one of the most prestigious streets on the Gold Coast of Long Island, this 14,000+ square foot custom built estate simply embodies perfection. Past the automatic gates, an almost quarter mile long undulating private driveway leads to the all brick residence with amenities including a fully integrated Crestron & Lutron systems, an in-ground pool, cabana with full kitchen and bathroom, tennis court, hot tub and zoned in the top ranked Jericho School District. The entrance leads into a foyer featuring a stunning custom dome with skylight, white marble flooring with accents, wood paneling and hand-made wood trusses running the full length of the room. The first level includes an expansive state of the art eat-in-kitchen with heated Jerusalem marble floors, Sub-Zero Fridges/Freezers, Wolf and Miele appliances, full size wine cooler, two kitchen islands, multiple sinks, breakfast area overlooking the property and double sided fireplace which is shared with the two-story family room with vaulted ceilings, wrap around balcony and walls of windows. The remainder of the floor includes a living room with fireplace, formal dining room with fireplace, circular conservatory with floor to ceiling windows, bedroom suite with sitting area and full bathroom, two-story library with soaring dome and multiple powder rooms. The second level boasts a luxurious master suite with master bathroom, steam shower, walk in closets, fireplace, sitting room and office. The second floor is rounded out by an additional 4 large bedrooms, all with on-suite private bathrooms, balconies, an upstairs sprawling den with powder room and walk-out terrace. The home has a full lower level with high ceiling throughout, bedroom and full bathroom. The estate has two separate garages with four parking spots, natural gas generator, landscape lighting, carport breezeway, tree lined property and more.